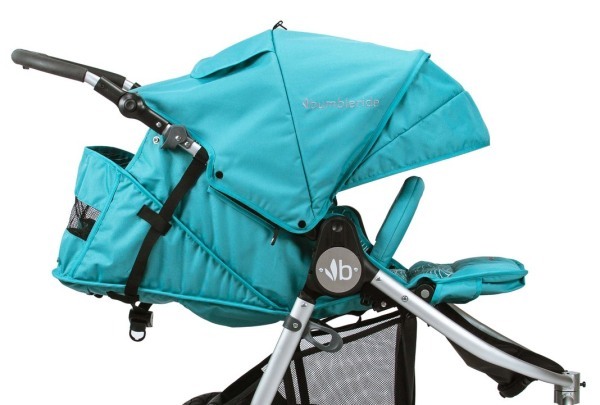 The Bumbleride Indie is designed with active parents in mind who like light jogging as well as want to have an every day stroller that comes with luxury features and would also go through some rougher terrain. Indie makes a perfect choice for mothers like me who are not seriously into jogging but still enjoy going for a jog every now and then. As a devoted fan of Indie who considered their previous model to be nearly a perfection, it made me excited to check out the improvements that Bumbleride provided. It comes with an updated canopy with UPF of over 45, which is now located higher on its frame and allows to accommodate taller kids. The coverage is still as great as always. It is also a bit easier to fold now thanks to the release triggers having been redesigned. The seat’s back now has new storage pockets, to store a small bottle of water and other smaller essentials like that. 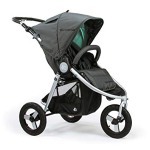 Jogging stroller 32″L x 19″W x 10.5″H One of the best jogging strollers! Bumbleride Indie comes with an all-wheel suspension. Adjustable handlebar makes it great for parents of all heights. The basket here is huge and pretty easy to access too. There were also new colors added, of course. The product’s new environmentally friendly fabrics consist of 100 percent recycled polyethylene terephthalate materials. On top of that, there weren’t any harmful chemicals used to make this. I like that. Even with all those upgrades added, Indie 2018 still only weighs twenty four pounds while being able to accommodate children as big as fifty-five pounds. 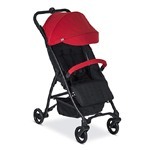 You can also convert it into a travel system with majority of the popular baby car seats out there. 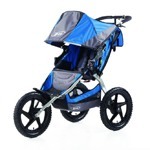 Its tires are large and filled with air, allowing it to go over all kinds of terrains, which makes it a very good jogging stroller even for off-road conditions. You can easily push it even when using just one hand. 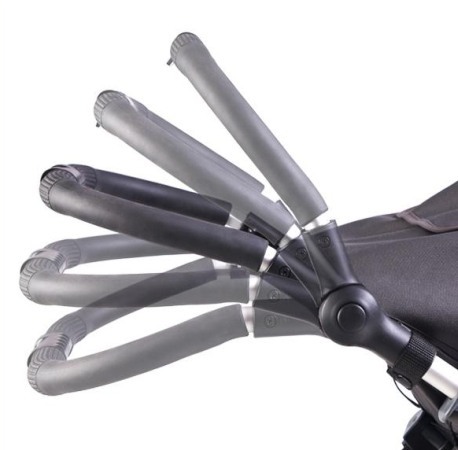 Among other features parents will love are the following: adjustable leg rest and handlebar, huge basket, lots of storage, mesh seat window, runaway strap and adjustable five-point harness. In 2018, the canopy’s been redesigned, which now makes it positioned higher on the frame, thus providing more headroom for bigger kids. The coverage is still as great as before, with 2 huge panels with UPF of over 45 and a huge pop out sun visor going nearly all the way to the bumper bar level. You also get a huge peek-a-boo style window made of dark mesh, closed with magnets instead of the Velcro strap found in the older model. Nice improvement. The seat is now a bit more spacious. It is 14.5 inches wide, with 19 inches of seat back and measuring 25 inches from the seat’s back to the canopy’s top. There’s also a one hand infinite strap recline, although you’re going to need both of your hands to put the seat back. The Bumbleride website calls it a lever recline though, although I have no idea why. It is a standard strap system. The recline here is pretty deep, going nearly to a flat position, making it suitable for newborns. There aren’t many joggers with a flat recline these days. Although jogging with a newborn is not a way to go, it’s still a nice option, as your kid has to spend less time in the car seat that way. They also increased the weight limit to fifty-five pounds, just like in most joggers. It comes with a padded, adjustable five-point harness equipped with a new release button located in the middle of it. Releasing the harness requires the button to be pushed a little bit harder. This buckle is actually quite difficult. I only figured it out after few times. 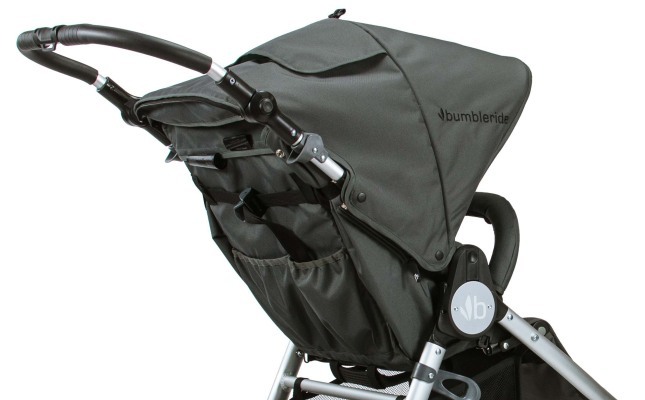 Interested in purchasing Bumbleride Indie? Check how much it costs on Amazon and see if there are any discounts available. The harness comes with four different positions available. The thing I really love about it is how the shoulder straps can be separated from the waist straps here. This makes it easier to take younger children out of the harness, plus older kids often don’t like using those shoulder straps, as they keep them constrained. It can go all the way from 26 to 45.5 inches above the ground level. It makes it great for parents of all heights. The handlebar is covered now with thermoplastic rubber, instead of foam, making it PVC-free and easy to clean. You can also easily navigate it with one hand thanks to a convenient grip located in the middle. The grip can be pretty useful when talking on a phone or walking a dog, by the way. What makes this seat truly unique is how it can convert into a bassinet-style environment for your baby. Just recline the seat back all the way to a flat position, then set the leg rest up all the way. It isn’t even required to get the bumper bar removed. 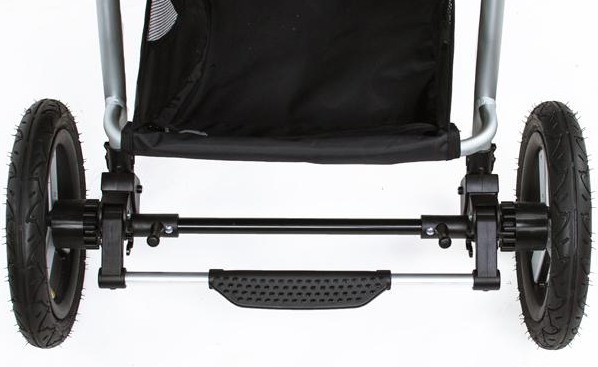 The leg rest has 2 little pieces of material under it, which can be clipped to either side of the seat, creating a bassinet-style environment for the baby. There’s also a thick piece of material there that runs all the way around the seat’s top, preventing your child from falling out when the canopy is unclipped at the back. Check how much it currently costs on Amazon, maybe you can find an attractive discount. 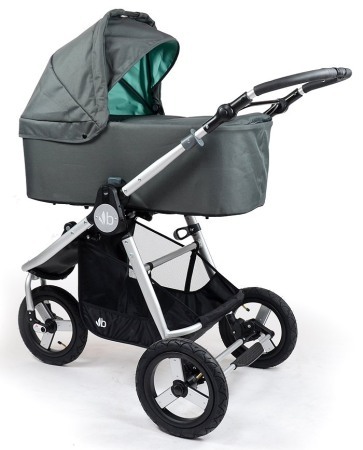 It is also possible to buy an actual bassinet to convert this stroller into a regular pram. 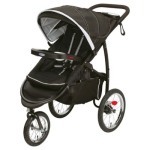 There aren’t many jogging strollers with a bassinet as one of the accessories out there. 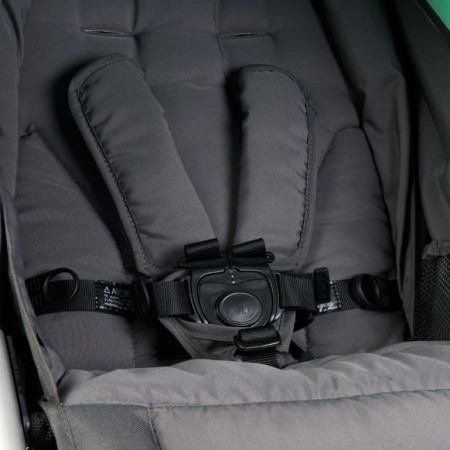 The seat’s back also comes with a new mesh that allows air to circulate better while also preventing your baby from accidentally sliding out when the seat is reclined all the way. That’s a big change from the previous version, which only had a tiny piece of material there. Among the biggest updates in Indie are its new, more environmentally friendly fabrics. The seat’s fabrics now use twenty-eight recycled bottles, compared to fourteen in the earlier version. The fabric-dying process used here is also innovative as it uses 89 percent less energy and water. The canopy has a tiny zipper pocket in its back, which can fit things like cell phone or keys. More place to store your stuff! You also get 2 pockets in the seat’s back and inside the seat. 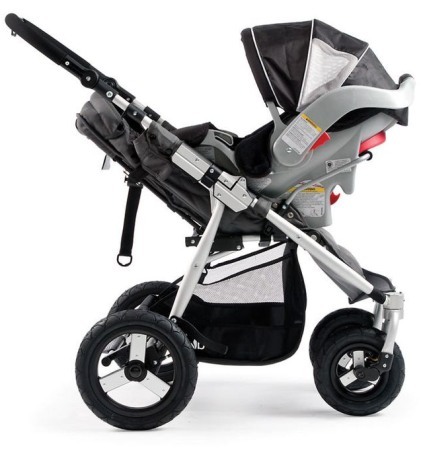 The stroller includes a detachable bumper bar. At last! Considering how much this stroller costs, I certainly expected to get a bumper bar at least, if not a full child-tray actually. Unlike a standard bumper bar we’re used to, however, this one is at an angle. It is covered with the fabric that also covers the canopy here. 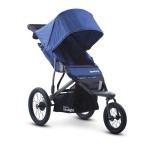 It can fold with the stroller, which means you don’t have to detach it. Unsure of picking this one? 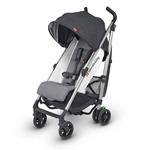 Click here and see what other parents think about this stroller. The adjustable footrest comes with many different positions, like an infant mode which can provide a bassinet-style environment here. It gives the baby a lot of stretch room when napping or being changed. The basket here is still huge and pretty easy to access too. They only added a little zipper pocket that can be used to store the included air pump. It can fit a huge bag of diapers and a lot of other things too. If you want even more storage, I suggest buying an universal stroller organizer for that. It allows you to bring along not just your coffee cup but also TONS of other thing like diapers, toys, snacks and more. You wouldn’t believe how many things you can fit in there. 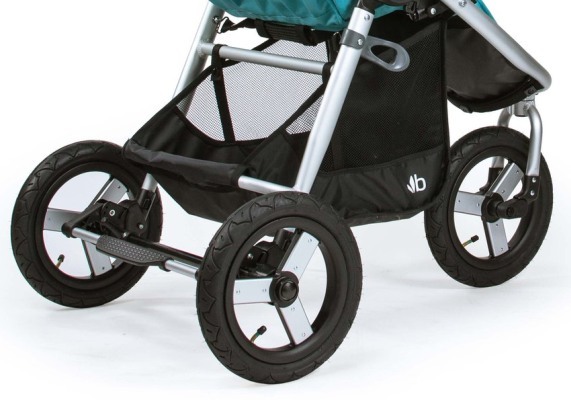 The Bumbleride Indie Stroller rests on three 12 inch tires filled with air that allow it to ride very smoothly. 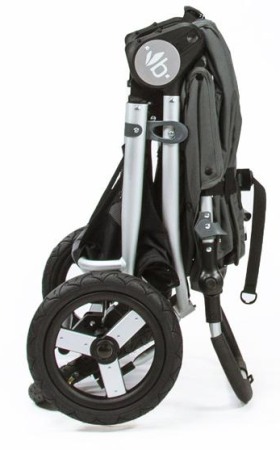 The back wheels pop off when you press a button, which makes this stroller even more compact after you fold it. The front wheels can swivel at 360 degrees or you can also lock them straight if you want to jog or push it over rough terrains. There used to only be a back wheel suspension. But now we have an all-wheel suspension. Awesome! Between the back wheels there’s a foot-operated brake. It can’t be operated when you wear flip-flops, though. It caused me to scratch my shoes and break some nails. You can fold it smoothly and easily in just one step. Just pull on both of the levers (which were redesigned for 2018 by the way) on the frame’s side and you have the frame unlocked, and now move the back wheels forward until it’s folded. 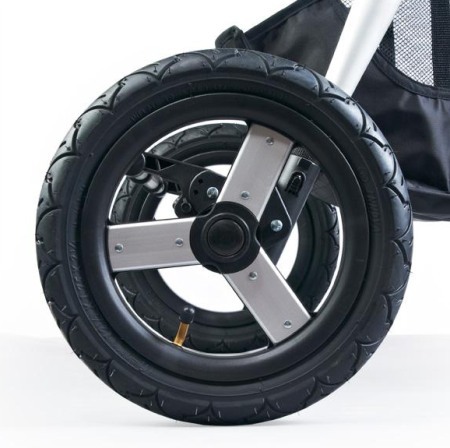 While there is a standing fold included, activating the auto lock requires bending down to the ground in order to press the stroller together. The dimensions when folded are 32 inches by 24 inches by 11.5 inches. This is quite bulky, but a jogger like this can’t get any more compact. 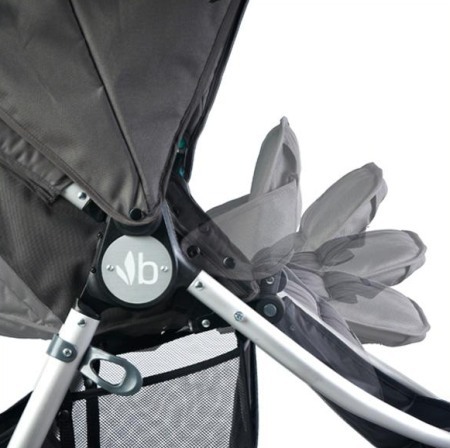 The Bumbleride Indie Stroller can be converted into a travel system for your newborn child. It is compatible with majority of popular car seats on the market. Don’t let me be the only one to give my thoughts about Bumbleride Indie. Check what other parents, who use it in everyday life say about it by clicking here! 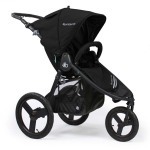 The Bumbleride company offers two jogging strollers – Bumbleride Speed and Bumbleride Indie. What’s different? Which one is better for running and which one to choose? First of all, both are perfect for running in any terrain. 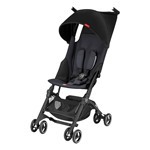 The main difference is the possibility of mounting a bassinet or a car seat. We will not do it with Bumbleride Speed. It’s a typical running model, has larger rear wheels to make running even more comfortable. 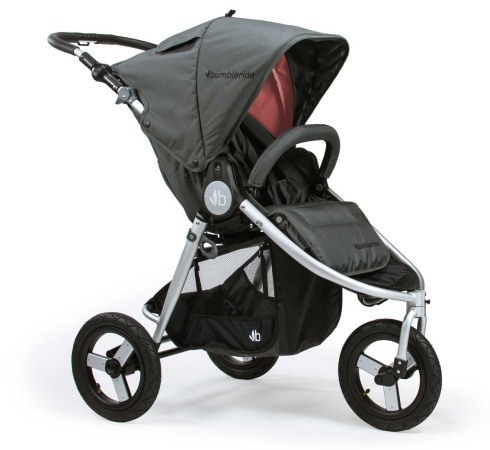 In turn, Bumbleride Indie is a stroller, which can also be used in everyday life. Below I present the basic differences between these two models. Infant Compatible It can be converted into a bassinet-style environment for your baby. Not compatible with any bassinet or infant car seat carrier.